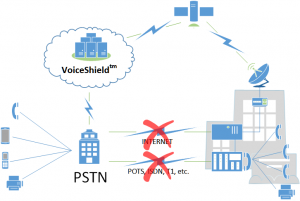 After an outage occurs, VoiceShield Satellite enables your existing phone system to switch over to a satellite connection, instantly restoring normal functionality and turning every connected station into a satellite phone. A single satellite dish can support up to 92 concurrent calls. Every Phone a Satellite Phone – Turn every phone in your facility into a satellite phone. Seamless Recovery – When primary service fails, calls to your published number are routed over satellite and answered by the extension or department inside your facility. Communications Survivability – Withstand complete local infrastructure failure and/or congestion.